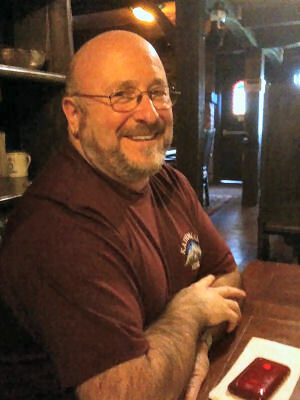 Meet Bruce, my hubby of 27+ years. For the third time in two months he's back in the hospital fighting a MRSA super bug. Seems the abscess in his thumb has flared up again, even though he was taking antibiotics. He's been there three days now and more or less resigned to the fact. You'd be right in guessing there's no weaving going on here right now. Though I did manage to take down the Christmas tree at 3 am last night...I couldn't sleep and it was annoying me standing there so 'cheerful'! So for the first time in 30 years we are apart on New Year's eve. We'd normally be at home sipping something and barely stay awake to see the new year in before going to bed.... but we'd be together. May I wish you all a happy, healthy 2012! Edit New Years Day: They let him go home today and we're hoping third time's a charm! Thank you everyone for your thoughtful messages! I'm resting my tired 'dogs' after four days of having my Dad and brother visit with us for Christmas! I enjoyed having them here and we would chat by the hour, eat, watch movies, eat, chat some more, eat....and for a change, eat some more! Then suddenly, it was all over and they are gone....the house sure feels quiet now! I hope that you all had a wonderful time with family and friends in the past few days and more to come in the week ahead till we welcome the New Year! I kept the ornaments on the light side near the bottom of the tree where they were in range of a curious Airedale! There was this lovely new addition to the tree this year from Dorothy in Scotland! Thank you Dorothy.... its a real sweet ornament and much admired by all house guests. A boat to represent the five years we lived aboard a boat (1988 to 1993). That's a whole blog post all by itself! The above grouping are little woven bands, with the beaded hanging cord inserted as a weft. They were woven by my friend Gudrun Weisinger. She has a lot of talent.... check these little gems out! Isn't she cute? a tiny pine cone, pipe cleaner, beads and an acorn hat sitting on a round wooden ball. I just realized there is one more with a jolly Santa but it must be on the back side of the tree and I missed it with the camera! I received only one hand woven card this year.... thanks Joan! My husband has been ordered back onto crutches to rest his achilles heel, but hopefully I can get back to weaving soon..... look, its patiently waiting for me! I have decided to increase the prizes for the Blogiversary from one to three guest towels! So your chances of winning just got better. Sign in as a 'Regular Reader' and you are entered. I will scientifically pick the names by drawing it out of a hat on January 8th. Wishing each of you a healthy, happy New Year! In 21 days, or on January 8th, 2012 I will have been keeping this blog for four years! It was a leap of faith to start it. To think that people would be interested in what I do and what I have to say! I had all kinds of intentions of keeping it on topic and no personal stuff but time progressed and life's events interrupted my weaving and so there went that condition! I have 'met' many of you through the blog and developed some wonderful friendships. I can also count four or five blogs that you might also follow as having had a big nudge from me to get their start. I can spot a new blogger in the making a mile away! I have tried to add blogs to my long list as I find them and try to be inclusive of textile blogs from all over. If you have a favourite that you like to visit and think it would be a great addition to my list, please send me the address! So why the picture of the towels? Well, I have one (sadly, just one) navy guest towel (with the single row of hemstitching) and on my Blogiversary, January 8th, 2012, I will draw a name from my list of 'Regular Readers' (or formerly Followers) and they will receive this guest towel as a gift from me. That is the only condition: be a Follower and be entered to win. Yes, this is me trying to get that number to shift... I'm stuck and it goes up by two and then drops by three, then up by one and... well you get the idea! I'm also saying thanks for reading! Our lives have resumed a more normal pattern, interspersed with occasional tests and doctor appointments. Hubby does not have infection in his foot bones so we are happy with that news! Both surgical sites are healing well and he's resting lots and actually listening to me! ( the married women out there are gobsmacked by the one I'm sure!) We have decorated the house, put up the tree and tomorrow some outdoor lights will be added to the deck railings to light up the dark. There is just the final polish to be put on the house and the special grocery shopping for the Day to come. My family will be arriving on the 22nd and the fun and games will be under way! Apart from admiring what is already in progress on the looms, no weaving will be happening for a spell. I wish you all a Merry Christmas and that you spend the time with friends and family! That Santa recalls that special something from your textile / tool wish list! I will try to get a post up again after Christmas! PS. Be sure to check out my sale page! Everything is listed now. It has been interesting to take a closer look at two guilds and two sales in two diverse locations. What sold well and what price point were the best sellers this year? The guild in the south central portion of BC had a one day only sale. I can see the benefits to this as the customer has but one chance to buy. There is no tomorrow or next week....buy it now or regret at your peril! This is also easier on the participants as we all have busy lives, getting ready for Christmas ourselves, or as in my case, having Life keep me busy despite other people's time table and plans. The guild members bring sweets and treats and have an area set up for tea and goodies (by donation) and encourage people to linger. There are staff members everywhere to assist and answer questions. The guild member playing her own harp that she made is a lovely touch too! 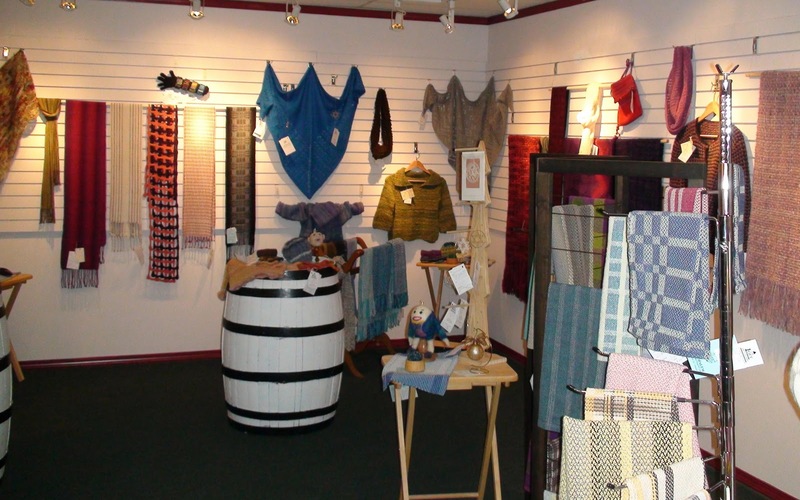 Their inventory runs the gamut of soaps and hand made wooden boxes to felted items, knits, skeins of yarn, weaving and jewelry. There are pressed flowers and hand made paper. What ever the guild members (and spouses) create, is showcased. The guild just acquired their sixtieth member and fully half of them participated. Here is a repeat of the FaceBook link to the pictures. Here are my sales stats for the inland guild: I submitted twenty two items and sold twelve. The prices ranged from $15.00 for guest towels, to $25.00 for tea towels and $99.00 and $125.00 for scarves depending on yarns used and complexity. The guild took a modest 5% commission and I got a nice cheque! I averaged $41.55 per item, so not too shabby! The southern Vancouver Island guild has a different approach which is mostly due to the conditions of their venue. They hold the sale on a mezzanine or loft above a retail business. The mezzanine is given over to local artists and groups to do displays for a month at a time and the retail business below takes a 25% commission. The inventory covered bobbin lace, felted items, hand knit sweaters, weaving and some small jewelry pieces. Pricing for my weaving was the same as for the other sale. The sale was held over thirty days and required at least two persons to cover the day in two shifts. That can be tricky getting sixty spots filled on a schedule! I was only able to work one shift during this time due to a family medical emergency. A guild member kindly covered for me on my second shift. The shift can be long and quiet if no one comes in or *very* busy if several customers do show. I had seventeen guests appear on my shift and was kept hopping; two items were sold that day. The location is in a shopping mall, above a wine u-brew shop which means there is the musty smell of wine the entire time. The upper floor is very warm as the heat seems to collect up there and wearing light clothing is recommended! The guild has roughly sixty members, with only sixteen contributing to the sale. I entered twenty two items to this sale as well, and sold seventeen. After the 25% commission, I averaged $18.83 per item sold. That's quite a difference! $41.55 per item in the Interior Sale vs. $18.83 per item on Vancouver Island! The local guild seemed to sell mainly small items with lower price points, or leastwise I did! I have yet to see a break down of the type of items sold other than grand totals for the monies but I'm sure they will look into what was popular this year. Though, no two years are alike as locally this year I sold no scarves at all and last year I sold quite a few here. You try to make things in all price ranges and then hang on for the ride! There are further differences between the two sales. One is all about one day and everyone knows it, seller and customer. There is one end goal: putting product and client together and they did that successfully this year and had their best year ever! Collectively they sold over $11,000.00 of hand made goods too happy people! That's amazing! Job well done! The Vancouver Island guild has just had their third year of selling at this venue and increased their over all sales but its a far harder slog for those involved. The venue was also closed one day a week and holidays. There was good advertising done by both sales but I noticed that the majority of people entering the retail business were there to either start their Christmas wine or bottle it. The U-brew displayed small signs indicating that a sale was going on upstairs, but as of my shift mid month, there was no window display as we had last year. I had to resist the urge to lean over the railing and call out an invitation to come up stairs while wine customers waited their turn downstairs! I must thank Lynnette and Ngaire for minding my weaving at the interior sale in addition to their own entries! Its fair to say that I could not have done it without you! I feel at a crossroad and must look into doing something far different for 2012 and will be looking at my options. I need a new game plan! I have listed some of the returned unsold items on a separate sale page (see the top menu bar below the very first picture). I will be adding more items as I get some decent pictures done! I hesitate to advertise something until I have it back in my keeping and can see its in the same condition I sent it to the sale. So please check back and I will collect the balance of my weaving this coming week and then update the list. Now, moving on.... The Hubby Report! So what happened? well, the signs and symptoms seem to add up to a (tentative) diagnosis of osteomyelitis and septicemia. A source of infection in the body had spread via the blood and settled into his bones (right heel) and appeared in various places as abscesses (example: his thumb for one location) It resisted normal antibiotics and so was classified as MRSA. He was kept isolated in a private room where doctors and nurses had to 'gown up' and wear gloves before entering his room. He had two surgeries in less than two weeks and no less than three ambulance rides for various high level tests including echo cardiogram, total body/bone scan, ultrasound, xrays and an MRI in Victoria and Nanaimo. 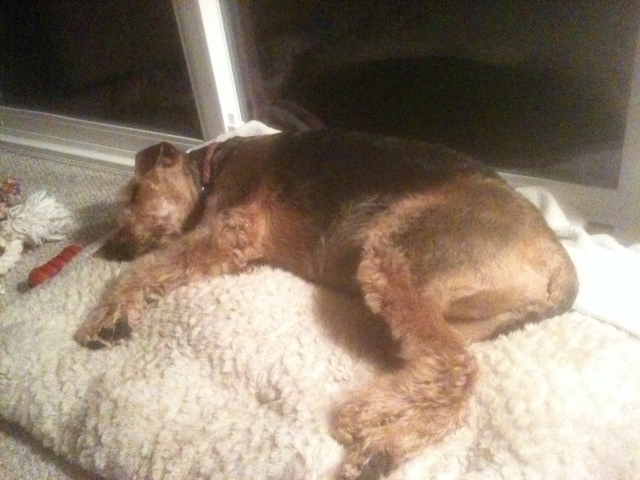 He is to continue with antibiotics and follow up with blood tests and doctor appointments in the days and weeks to come. His job is to relax and get well.... and write more stories at his blog. We may never know the source of the infection for sure! It could have been the routine procedure back on November 1st or it could have been far earlier as a bone infection can take two to three months to settle in. Either way we are hopeful that the worst is behind us ! Bruce thanks you for all the supportive comments you have sent via emails and messages to my blog posts. Your messages of hope and encouragement have meant a lot to both of us. A couple of months ago I was answering questions on the Beginner Weaver forum at Ravelry.com. There are a number of weaving related groups there and we form a little enclave in the midst of knitters / crocheters galore! 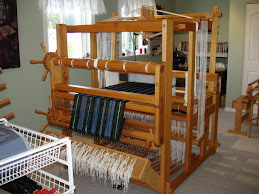 A newbie weaver, Jennifer was asking about using an end delivery shuttle on her table loom. Well, why not? Anything that gets the weft across, though a EDS is sort of wasted on a table loom. It would be more of a pass through than a throw! It was a beautiful shuttle she had found at an antique store in North Carolina... or it came from a textile mill in the Carolina's. I'm a bit fuzzy on the details right now. It was lovely and I was coveting it! I collect shuttles and ones like this don't usually cross my path on Vancouver Island too often. I wrote to her and said that if she came across another, to keep me in mind. Well, imagine my surprise when she said she had two of them! She was willing to sell one to me. The pictures here were taken by Jennifer. The tightly wound yarn on the wooden pirn is polyester and its wound *perfectly*! The inside of the shuttle has these synthetic filaments that hugs the end of the pirn and tames the yarn as it flies off in the shed. Great idea for very fine yarns. Its the ultimate in yarn control! I can't find any identifying marks on it at all so if you recognize this shuttle or know something about them, please email me at the address shown on the right hand side of the blog. There is one small detail about this shuttle that took me completely by surprise.....the size and weight! Here are pictures taken by me....and you might want to click on these to get a feel for the dimensions! So its roughly 17 inches long and while I haven't weighed it (yet) its really heavy! My husband was readmitted to hospital and is fighting one of those nasty MRSA super bugs. He had a second operation today and this time it was on his hand by a plastic surgeon. We are hoping that this now means he can start to heal and the antibiotics can do their job. I must wear a lovely yellow gauzy gown (yellow is NOT my colour) but they do coordinate nicely with the blue non latex gloves that every one entering the room must wear. Its been a long month as we have been dealing with this since November 1st. We decided it was unfair for Calli to be cooped up in a kennel so I took her to the doggy resort and when I last saw her, she had a huge grin and was being chased by a little Yorkie! I'm happy that she is playing with other dogs but it means the house is rather empty. This would be a supreme weaving time but I have no heart to throw a shuttle and, to be honest, I'm too tired to play with my toys. I am chipping away at Christmas tasks and I have even placed a yarn order! Webs web site said it was all in stock and no sooner than I hit 'confirm' for the order, half of it was immediately back ordered! PS I have created a sales page (see top bar) for some of my handwovens that came home from the Christmas sales. More will be added as time allows so please check back!